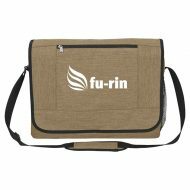 This promotional and perfect for every day use High Line Messenger Bag is a sleek and elegant messenger-style bag that is made of durable 600 denier polycanvas material. Features an adjustable padded shoulder strap, front zippered pocket, side mesh pocket, zippered main compartment, and a hook and loop closure. Imprinted with your logo to complete the promotional look. Order today! Optional Embroidery & Multi-Color Imprint Available! 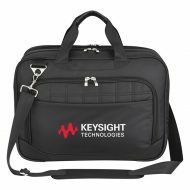 Clients will know you mean business when you advertise on this promotional Superlative Laptop Briefcase! Made of 840 denier polyester with 210 denier PVC lining, this customizable laptop briefcase features a large double zippered front compartment with inside and outside zippered pockets and lots of compartments for accessories. It includes a padded pocket for laptop and tablet and an expansion zipper that provides 2 1/2″ of additional space. It accommodates most laptops up to 17″. 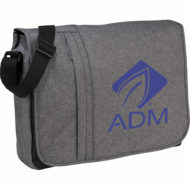 Recipients can carry it by the detachable and adjustable padded shoulder strap or web carrying handles with comfort grip. There’s even a trolley sleeve with hook and loop closure that attaches to wheel cart. Order today! Optional Embroidery or Multi-Color Imprint Available! This custom printed Urban 15″ Computer Messenger Bag offers modern design and can hold a 15″ laptop. Features a main compartment with padded 15 inch laptop sleeve and organizational space. A front vertical zipper allows for easy access to your phone and everyday essential. An adjustable shoulder strap provides for carrying comfort. Order today!